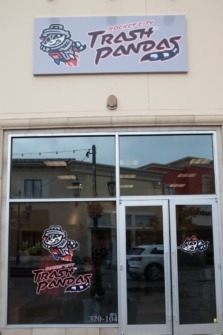 The area’s new minor league baseball team hasn’t played an inning. Heck, it doesn’t even have a ballpark. But that didn’t deter fans from showing up and buying merchandise Monday. The grand opening for the store at Bridge Street Town Centre is set for 9 a.m. Saturday. The team will also be taking deposits for season tickets – the fee is $250 per seat. There will be brochures available so fans can see the seating for the new ballpark – which is expected to be finished by the end of next year. The Trash Pandas officially begin play April 15, 2020; meanwhile, the team is still the Mobile BayBears through next season. Monday’s activity, though, was supposed to be a “soft opening” for the store. “It’s been steady,” said Jennie Askins, the team’s vice president of corporate and community partnerships. “We didn’t promote this. This was to give our Trash Pandas Ambassadors (sales staff) a chance to learn and talk to people. Things were running pretty kink-free Monday as the steady flow of fans made their choices of apparel – ranging from jackets to caps to hoodies and T-shirts.